It happens each year around the same time. Summer heat arrives and then – bam! – a bushel of zucchini lands on your doorstep, courtesy of a neighbor trying to offload their backyard bounty. Or, maybe zucchini is just one of those vegetables you have no idea how to cook. Well, the good news is, you don’t even have to cook it; it’s great raw in many dishes. And because it kind of has a split personality, you can use it in everything from stir-fries to cupcakes. Is Zucchini a Fruit or a Vegetable? Bright green zucchini squash is part of the gourd family. Along with its yellow cousin, the summer squash, it is considered both a fruit and a vegetable. The fact that zucchini contains seeds makes it a fruit, but it is used as a vegetable in most recipes. Look for zucchini that’s about 4-6 inches long, and looks firm and shiny with no breaks or cracks. Large, older fruit will be tough and bitter; the best way to use very large zucchini is in zucchini bread. It can be kept in the fridge for up to one week. When you’re ready to use it, wash the zucchini, then slice both ends off. If the skin of the zucchini has been waxed (to extend its shelf-life), peel the skin, but leave the skin on if it’s unwaxed. Larger zucchini should be peeled first because the skin can be bitter. Golden zucchini blossoms, the flowers on the zucchini plant (pictured below), are also edible. They can be battered and deep-fried, baked, stuffed or used as a garnish for high-class dining! Zucchini is Good For You, Too! Zucchini is a great source of vitamins, minerals and dietary fiber. It’s high in water content, has only 20 calories per cup and is low in saturated fat and cholesterol. Shred or grate raw zucchini into salads, or cut it into spears for vegetable platters. Grill it: Slice zucchini lengthwise, brush it with olive oil, sprinkle both sides with whatever fresh or dried herbs suit your fancy and some salt and pepper to taste. Grill outside on your barbecue or indoors on a grill pan for about 5 minutes on each side until crisp-tender. Chilled Zucchini Soup is the perfect starter for a hot summer night or an afternoon brunch. Make it ahead of time and dish it up right before serving. The Italian version of an omelet, this Zucchini Frittata is simple to prepare and versatile. It can be eaten hot or cold, taken to picnics, packed for lunches or served as an appetizer at your next brunch. Here are tons of kid-friendly recipes for zucchini that your kids will love! A staff favorite from Food & Wine, Farfalle with Yogurt and Zucchini calls for just 5 ingredients, plus nutmeg. This fast bow tie pasta meal is made with yogurt, instead of cream, for a unique taste sensation. Grilled zucchini is super simple and super delicious! This Zucchini Bread Recipe makes two large loaves or 24 muffins to eat or freeze. You can’t get much easier than this, and your kitchen will smell sweet and spicy! Double Chocolate Zucchini Bread is a perfect when you need a chocolate fix. Great article on the different ways to cook zucchini! 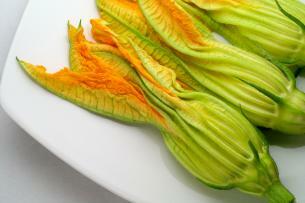 I love zucchini blossoms but haven’t found any at my doorstep yet. Guess I will have to grow them myself. Or move to a new neighborhood! Thank you for this article, I appreciate it even more because it is not so common to find those kind of things on the net. Thnx! I really love zucchini, but not as the main ingredient. It really is pretty bland on its own. But added to ratatouille or zucchini bread and suddenly the taste pops! I always avoid buying the really big ones – too many seeds inside! I have yet to have fried zucchini blossoms. But I plan on asking my Sicilian mother in law to show me how so I can learn myself! I love zucchini with my pasta! Please do let us know your mother in law’s secrets! Sure thing Kathy! I really want to learn more recipes with zucchini – I might feature a month on the topic at my website. Will let you know. This is the first year I have grown my own zucchini and wow what a surprise, I never knew you could eat the blossoms!!! This is also the first time I’m cooking it so wish me luck!! !